Volunteers Step Up for 2010 International Coastal Cleanup! CRM and DEQ are calling motivated groups to volunteer for the International Coastal Cleanup on 24-25 September, 2010. Big thanks out to the groups already registered, we're looking forward to the event! This is a lot of beaches folks - spread the word about the International Coastal Cleanup and let's have one group at each one! All people in government, we'd love to see a better showing of government agencies. Private organizations and clubs, this is great way to spend a couple hours giving back to the community that you're working in. Last year volunteers diverted hundreds of bags of trash from Saipan's coastal areas. Let's make an even larger impact in 2010! To sign-up for the event, please fill out the sign-up sheet and email it to rachel.zuercher@crm.gov.mp or fax it to 664-8315. For more information, contact Rachel Zuercher at 664-8305. For more information about the cleanup or to request a registration form, please call 664-8305 or email rachel.zuercher@crm.gov.mp. Thanks! In seven short days, the Saipan Blog will play host to the 40th rendition of Carnival of the Blue. Carnival of the Blue is a rotating monthly compilation of the world's "best of" ocean blogging, bringing together ocean bloggers and readers and (hopefully) using new media to build a virtual community of ocean lovers. The theme for Carnival of the Blue 40 is Top of the Food Chain. Carnival of the Blue 27 - Oh, For the Love of Science! Carnival of the Blue 30 - Oh, for the Love of Science! Carnival of the Blue 35 - Oh, for the Love of Science! Coming next week: Carnival of the Blue 40! Wow - this is really, really great news. After several years of running into challenges, it's great to see this program in operation. It is also a fantastic example of how if we work together, we can Beautify CNMI! Kudos to those who are finding the power of networking resources!!! Keep up the great work everyone! 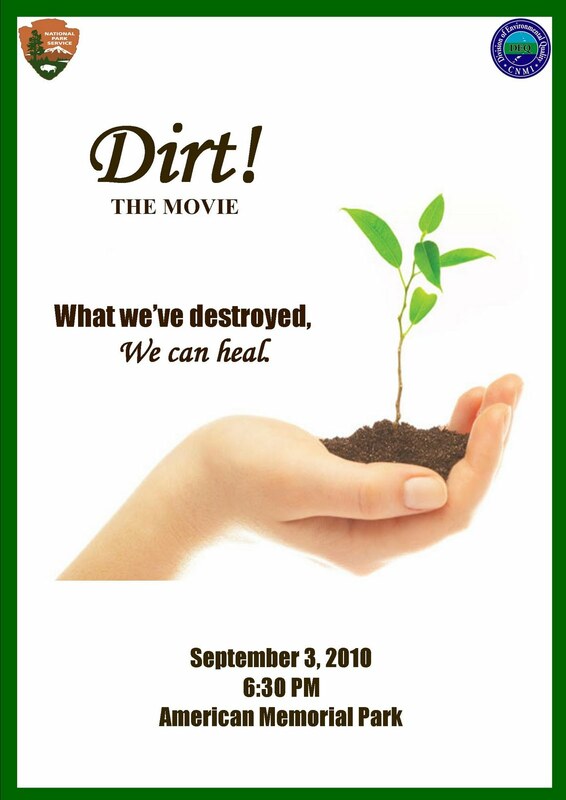 Coming up in September DEQ and the National Park Service have another great documentary they are showing, Dirt! the movie, that discusses our reliance on the Earth's soil and the damage we have wrought on it. The film will be shown at the American Memorial Park Visitor's center at 6:30pm on September 3rd (previous viewers note the new time!). 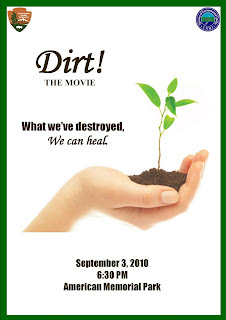 Official selection to the 2009 Sundance film festival, and winner of several awards (including Best Documentary at the Maui and "Visions/Voices" film festivals), Dirt! tells the story of Earth's most valuable and under appreciated resource, from its miraculous beginning to its crippling degradation. The movie seeks to revolutionize the way we see dirt and raise awareness to the plight of one of our most important resources. Rather than simply bemoan the situation, Dirt! offers a myriad of actions that we can take as communities to promote the rebuilding of soil and the sustainable use of it, reminding us that "What we have destroyed, we can heal". "An invogorating look at an invaluable substance we take for granted." "...an uplifting story about people from all walks of life who are striving to renew our relationship with the ground beneath our feet"
You can see the trailer and find more information about the film here. Please join us for this wonderful film on September 3rd. As always it's Free! The release date for Our Northern Islands, Dennis Chan's book about the first expedition to the Mariana Trench Marine National Monument, is September 14, 2010. 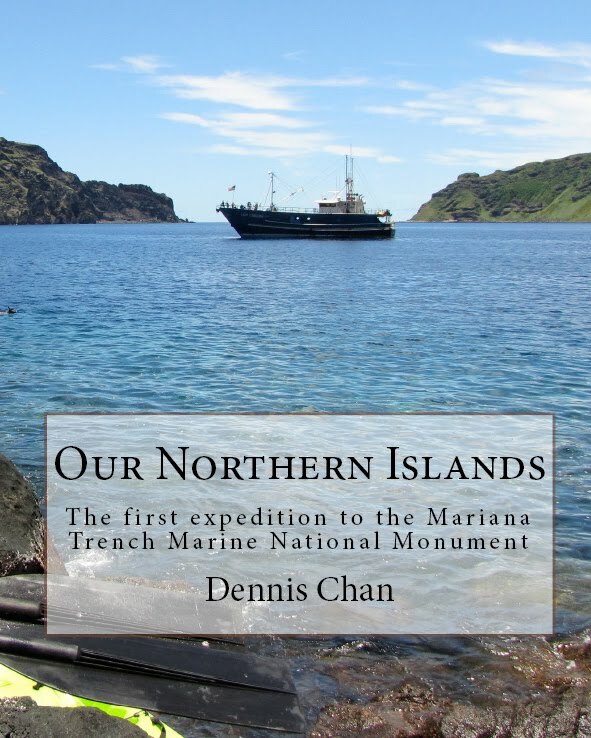 Advance copies will be made available at a discounted price to fans of Our Northern Islands' Facebook page. We invite you to join us on Friday, September 24 or Saturday, September 25, for the 25th annual International Coastal Cleanup. DEQ will retrieve and properly dispose of the trash and recycling collected from the cleanup on Saipan. We will coordinate with your organization/group to determine a pick up point. ***To register, please CLICK HERE to download the sign-up sheet (second page) and submit it to Rachel via email or fax. Instructions included on form. Thank you. Sorry for the late notice, but this month's Beautify CNMI! monthly meeting which was scheduled for today (August 12) has been postponed. We will resume our regular monthly meetings after our summer break next month. I'd appreciate your spreading the word. Essay topic: What traditions do your family or community teach that help protect the ocean, reefs and other ocean animals? Many communities in Micronesia do things every day to protect the ocean, the coral reef and sea animals. Some traditions have developed over thousands of years. Others have only recently been developed with the help of technology or new information. These traditions and practices are very important to preserving the culture of Micronesia and the many natural resources of the area. Without traditions that protect the fish, land and ocean we will be left with nothing. The increasing pressure on natural resources including pollution, destructive and overfishing techniques and increased population only increases the need to recognize these traditions as an important part of our culture and preserving ocean resources. Rules: The contest is open to any 9th-12th grade student enrolled in a school in Guam, the Commonwealth of the Northern Marianas, the Federated States of Micronesia, Palau or the Marshall Islands. A student is defined as someone who currently attending school during the 2010/2011 school year. Entry must include a typed essay of 1,000-1,500 words, and a cover sheet including the student’s name, mailing address, phone number, e-mail address, and date of birth. High school students include school and grade. Entries must be in English but may also be submitted in the student’s native language. Entries that use information academic sources must cite their sources. Any academically acceptable referencing style may be used. Entries may only be submitted once and there can only be one entry per student. More than one entry from a student will not be accepted. Failure to follow these rules may lead to disqualification from the contest. Entries will be judged on originality, expression of ideas, presentation, and understanding of traditional practices and culture. All entries become of the property of the Guam Coastal Management Program . In addition to receiving cash prizes, winners may have their essays published additional material. The deadline is 5pm (Chamorro Standard Time) on Tuesday, August 31, 2010. Photo topic: What traditions do your family or community teach that help protect the ocean, reefs and other ocean animals? Photos should display some aspect of how many communities in Micronesia do things every day to protect the ocean, the coral reef and sea animals. Some traditions have developed over thousands of years. Others have only recently been developed with the help of technology or new information. These traditions and practices are very important to preserving the culture of Micronesia and the many natural resources of the area. Without traditions that protect the fish, land and ocean we will be left with nothing. The increasing pressure on natural resources including pollution, destructive and overfishing techniques and increased population only increases the need to recognize these traditions as an important part of our culture and preserving ocean resources. Entry Rules: The student contest is open to any 9th-12th grade student enrolled in a school in Guam, the Commonwealth of the Northern Marianas, the Federated States of Micronesia, Palau or the Marshall Islands. A student is defined as someone who currently attending school during the 2010/2011 school year. The general public contest is open to any resident of Guam, the Commonwealth of the Northern Marianas, the Federated States of Micronesia, Palau or the Marshall Islands. A resident is defined as someone currently living in the mentioned areas. Photo entry details: Each photograph is a single entry. A printed piece with several photographs must have a dot or some other mark indicating which specific single photograph is to be judged. If a single photograph isn't indicated, the entry will be disqualified. Campaigns or series are limited to five photographs but will be judged as one photograph. If the entry has more than five photographs, indicate which five are to be judged. If this isn't indicated, the entry will be disqualified. Photos must be submitted with cover sheet including a title, a brief description of the photo, the participants name, mailing address, phone number, e-mail address, and date of birth. High school students include school and grade. Entries must be in English but may also be submitted in the student’s native language. · Digital files: RGB (not CMYK) JPG format with a maximum width of 1024 pixels and a maximum height of 768 pixels (72dpi). Entries can be submitted online at www.guamenvironmentaleducation.com. Entries may only be submitted once and there can only be one entry per student. More than one entry from a student will not be accepted. Failure to follow these rules may lead to disqualification from the contest. Entries will be judged on originality, expression of ideas, presentation, and understanding of traditional practices and culture. All entries become of the property of the Guam Coastal Management Program . In addition to receiving cash prizes, winners may have their essays published additional material. Next month the Saipan Blog will be the host of Carnival of the Blue 40, or as I prefer to call it, Carnival of the Blue XL. COTB XL promises to be the biggest, baddest COTB EVER. Why? Well, not only is COTB turning 40, but the theme of next month's carnival is going to be Top of the Food Chain. COTB XL is going to be all about predators, baby. Please use this online article submission form to submit your contribution to COTB XL. Please try to make your post about predation (¿cómo se dice de tiburón en Inglés? ), but if the predation bug doesn't hit you this month, COTB XL will still publish your ocean blog. If you have any questions you can email me at angelovillagomez at gmail dot com. By the way, this will be the fourth consecutive September the Saipan Blog has hosted Carnival of the Blue. The Saipan Blog has previously hosted Carnival of the Blue IV, Carnival of the Blue XVI and Carnival of the Blue XXVIII. A public lecture will be held at American Memorial Park amphitheater "Eco-Tourism: Good for the CNMI"
She holds degrees in marine policy, biology and geology. She will discuss costs and benefits of alternative options, and their compatibility, feasibility in the CNMI. The presentation is supported in part by MINA, the Mariana Islands Nature Alliance. PDM Promoters, Inc. volunteers and some Kobler kids of the Saipan Awaodori Team will also hold their monthly clean-up at the Garapan district (Paseo de Marianas) this Saturday August 7, 2010. The cleanup usually starts at 8 a.m. or shortly thereafter. Thank you PDM Promoters, Inc. and Saipan Awaodori Team for leading this effort. This invitation was extended by Sonia G. Siwa,Volunteer,PDM Promoters, Inc.
(DEQ) – The Division of Environmental Quality (DEQ) cleanup brigade will be at it again, picking up trash at the Outer Smiling Cove Marina. First Friday Films is here again, and this month the Division of Environmental Quality (DEQ) and the National Park Service (NPS) will be screening Sharkwater. As always the film will be free and open to the public, and will be shown at the American Memorial Park visitors center at 7:00pm this Friday (August 6th). Sharkwater, the winner of 31 international awards (details here), is a film documenting the exploitation and corruption surrounding the world’s shark populations and the effect we are having on our ocean ecosystems by removing these top-level predators. Through this documentary, director Rob Stewart seeks to debunk wide-spread stereotypes and media depictions of sharks and to detail their roles as pillars in the evolution of the seas and corner stones to their continued health. The film addresses how "these magnificent creatures have gone from predator to prey, and how despite surviving the earth's history of mass extinctions, they could easily be wiped out within a few years due to human greed." (cited from Stewart here). Following the film, local experts from DFW will be on hand to discuss the status of our regional shark populations and steps we can take to protect them. "Sharkwater will change the way people view sharks and the ocean. It will open their eyes... and, hopefully, their hearts." 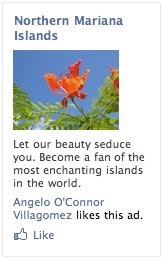 Become a fan of the Northern Mariana Islands on Facebook.